The 2011 class of Leadership Johns Creek recently led a project to enhance the Johns Creek Greenway through sustainable improvements. The improvements to the trail near Johns Creek High School included benches, shrubbery, trees and birdhouses. The Leadership Johns Creek group, known as Team Nspire, worked diligently on the project to ready the site, coordinate the improvements and secure community donations. Gwinnett Medical Center Duluth and Northside Hospital contributed the benches. The Johns Creek Home Depot provided shrubbery, trees, most of the mulch, pavers and the sand upon which the pavers were laid. Personnel from Epic Response laid the concrete pads. Other donors included Steven K. Cox, Wild Birds Unlimited, Kroger, Publix and Pike Nurseries. 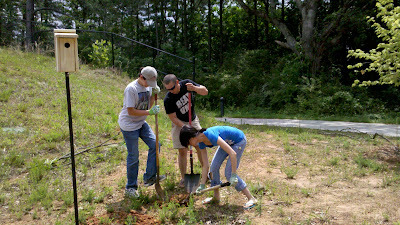 Students from Johns Creek High School helped Leadership Johns Creek team members prepare and plant the Greenway. As part of the project the team chose native plants, installed birdhouses, and designed the landscaping areas to be wildlife friendly so the Greenway could be certified as a NWF Wildlife Habitat.